I’ll be honest – when I read about the National Parks Board’s (NParks) Biophilic Playgarden Plan, I had to do a quick search on the meaning of “biophilia”. Simply put, biophilia refers to the innate affinity that humans have for other forms of life, such as open, grassy landscapes. I suppose it’s biophilia that pushes us to make snow angels in the ground on a winter’s day, or when we gasp – then sigh – at the sight of Mount Fuji on a clear day. 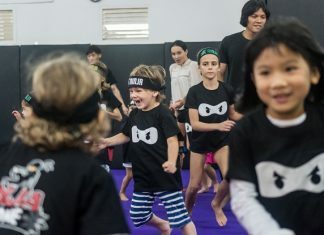 After months of research – including consult sessions with parents, Early Childhood Development Agency (ECDA) and preschool operators, and visits to countries like Japan to learn more about their biophilic playgrounds – Nature Playgarden in HortPark, Singapore’s first biophlic playground, is born. 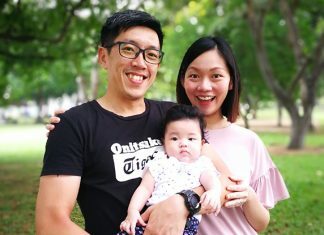 In spite of the heat (we were there at noon), my daughter and I had an awesome time at Nature Playgarden, and I’m really looking forward to what NParks has planned for the future of playgrounds in Singapore, including biophilic playgardens within reach of every preschool child across the island. 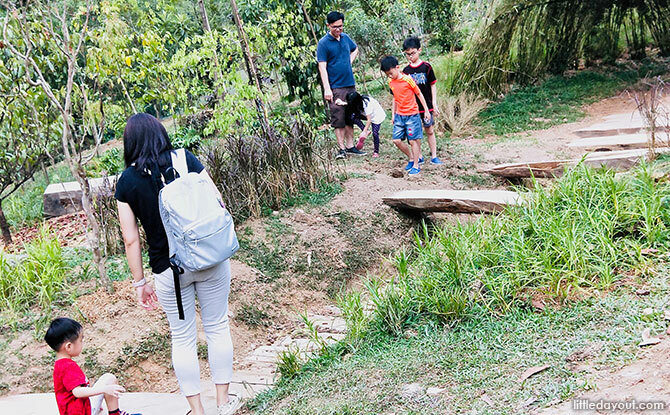 Located just behind Hands-On House at HortPark, Nature Playgarden in HortPark is 0.35ha of lush greenery that wouldn’t look a leaf out of place in a fairytale. 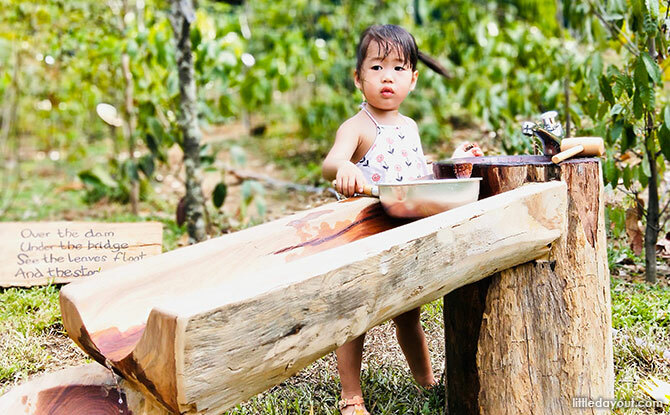 Made up of nine different play zones, Nature Playgarden has been designed to allow and encourage child-directed play at a very basic level with the use of natural and recycled materials from logs, twigs and branches, to soil and water. 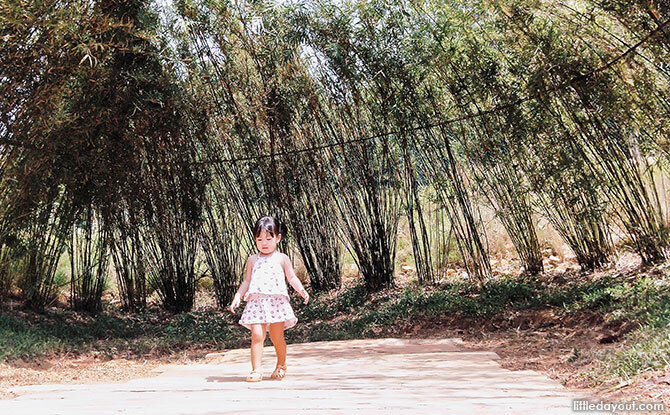 As is usually the case when outdoors, I let my daughter explore Nature Playgarden freely. Aside from reminders now and again to watch her step, or to lend a hand when she needed me, I kept my distance, and my mouth shut. If she wanted to climb over a log, then crawl under another to get to The Secret Den – I let her; if she wanted to bury her hands and feet in the sand by The Building Huts – I let her. And when she escaped from the blazing sun to The Magical Woods – I let her. All in, it was lovely watching her make sense of everything around her; she really was in her element. 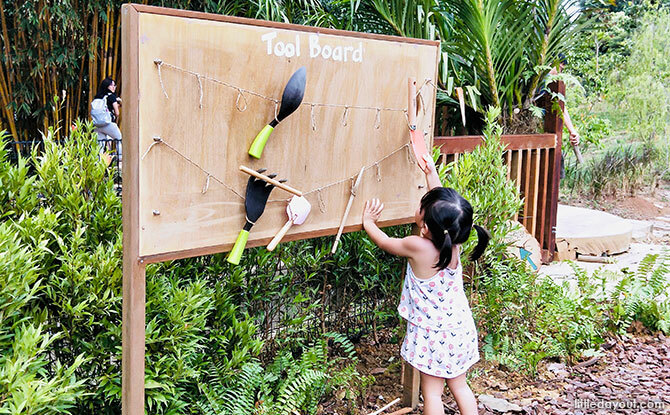 When she was in The Kitchen, she knew what she wanted to do with the soil, and when she came across the Tool Board, she knew exactly which tool she wanted. And what she would use that tool for would be different to that of another child in the very same surroundings. 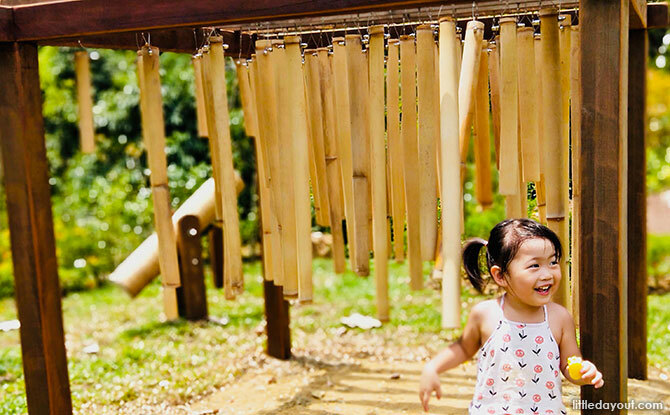 That instinct is exactly what NParks hopes to see as they use Nature Playgarden as a testbed as they work to design other biophilic playgrounds in Singapore. 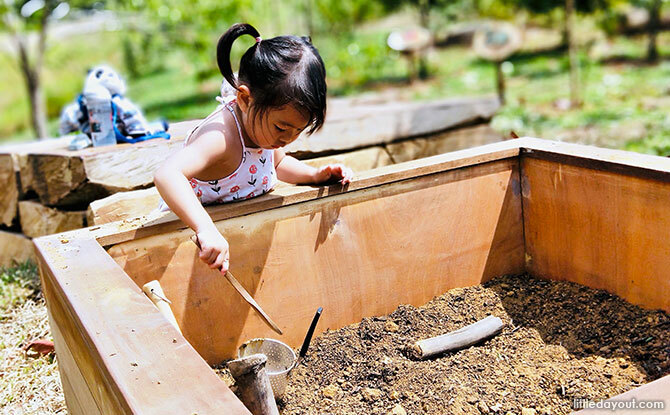 There is no such thing as play-based learning in Nature Playgarden – the children are invited simply to play and create as their hearts desire. 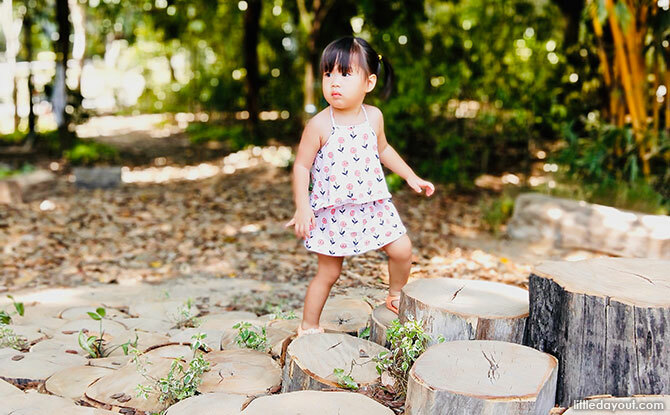 As your child manoeuvres the natural unevenness of logs and gravel flooring, he or she will be getting fit and honing their gross motor skills without even realising it. Or watch them practise some fine motor skills as they scoop soil into a sift. 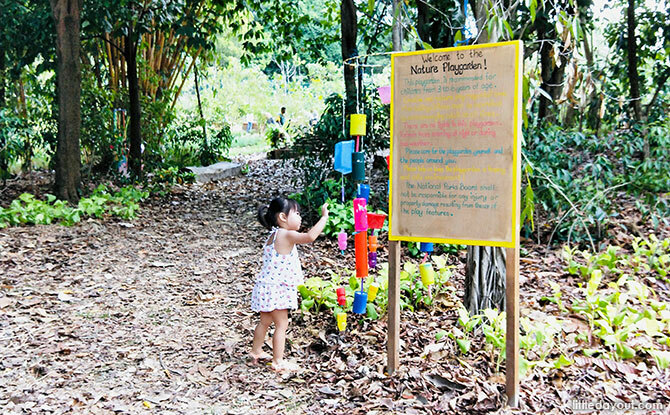 Even literacy comes alive in Nature Playgarden as the little ones listen to mummy or daddy read the poems specially created for the different play zones. 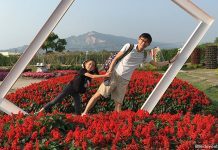 I’d go as far as to say that NParks has thought of it all in their design of Nature Playgarden. I mean, The Stream has potable water that you could use to clean yourself up if you get too mucky and sandy! 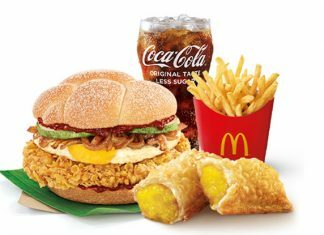 NParks has made an exceptional first effort in taking open-ended play outdoors. 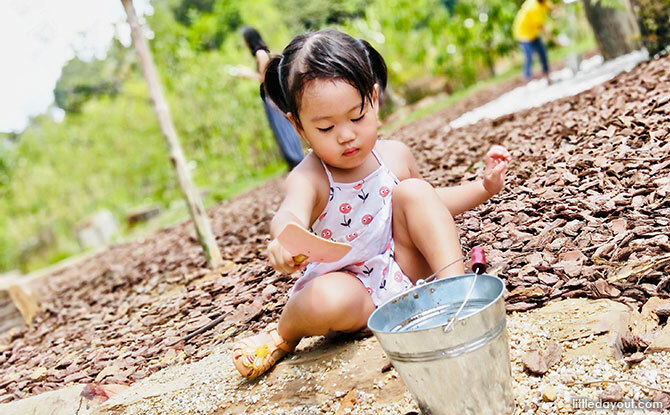 If you’ve been looking for a safe environment in which your toddlers can get in touch with nature – which we know is beneficial to their overall development – Nature Playgarden is the place for you. I love getting my daughter outdoors for lots of Vitamin D and fresh air, and as much as she likes getting on her skate scooter, she also enjoys getting dirty. I reckon we’ll be at Nature Playgarden a lot more in the near future! 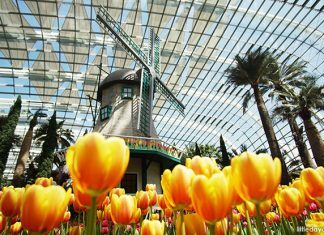 HortPark is opened daily from 6 am to 11 pm but avoid visiting Nature Playgarden after the sun has set as there are no lights illuminating the play zones. 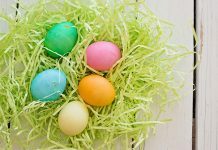 It is recommended for children aged three to six. To learn more about Nature Playgarden or HortPark, go here. While at HortPark, you may want to check out the Bee Trail At HortPark: The Buzz On The Bees.